Are You Seeking A New Life? Living well requires nurturing the mind, spirit and body. When out of balance, we feel tired, stressed and unable to experience the joy of life. When healthy and whole, there’s nothing we can’t achieve! NeoLife literally means “new life” and represents the power of giving your body the nutrients it requires to live a life of health and vitality. Build a new life through better nutrition…. from a company known for quality and integrity. Do you want to lose weight and tone up? NeoLifeShake is designed to fuel your body with lean protein, over 25 vitamins and minerals, and fiber. Made of our proprietary protein blend and based on the science of Glycemic Response Control Technology, these shakes are a daily boost to help you be your best. Pro Vitality gives you support for a healthy, active life. The Breakfast Pack is designed for optimal cellular nutrition by giving your body key whole food nutrients and protein, the building block of life. 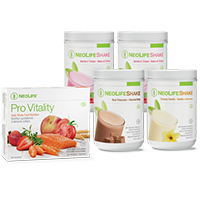 This program contains one (30-serving) box of Pro Vitality and two (15-serving) NeoLifeShake canisters. Are you looking for more energy and vitality in your life? All 8 omega-3s involved in human nutrition for joint comfort and inflammation balancing. Promotes cardiovascular health, youthful brain function, healthy flexible joints, and healthy eyes. It’s the first supplement of its kind to assure a standardized amount of all eight members of the omega-3 family involved in human nutrition. Based on pure, natural salmon oil. All sources are screened for more than 200 potential contaminants. B vitamins for sustained energy and a healthy metabolism.Promotes the active conversion of all food into energy and assists in synthesis and re-energizing of cells and tissues throughout the body. Do you suffer from bloating, gas, acid reflux, diarrhea or eczema? Intestine-targeted digestive enzymes support complete digestion of proteins, fats and carbohydrates. Promotes healthy digestion in the intestinal tract. Supports healthy, stress-free digestion and optimum nutrient availability. Eases heartburn, gas and bloating before it starts. Supports efficient digestion in the stomach. Time-tested goodness of pure Aloe Vera Plus in an exclusive, proprietary blend creates a refreshing, delicious drink. Designed to restore mental composure, yet keep you feeling energetic, Aloe Vera Plus delivers nature’s “soothing power” in a delicious, refreshing drink. Soothes the digestive system and stress-induced digestive discomfort. Intestine-targeted probiotic capsule with 3 billion live micro-organisms for gut health. Promotes colon health and supports immunity with a healthy balance of intestinal flora. Versatile fibre powder for drinks or recipes to support heart and colon health. Exclusive Neo-Polyfibe helps remove cholesterol without robbing nutrients. All Natural Fibre provides 6g of fibre per serving – 5g insoluble and 1g soluble and is suitable for a vegetarian/vegan diet. It helps promotes regularity and tastes great by itself or when mixed wth other foods or protein drinks. Are your kids always getting sick and do they have a challenge paying attention in class? Complete formula fills children’s most common nutritional gaps, and includes Tre-en-en Grain Concentrates to help cells receive nutrients efficiently.Includes choline and inositol to support cognitive functions such as learning and memory. Loaded with 18 essential vitamins & minerals. Tre-en-en® Grain Concentrates support healthy cellular function. Great tasting chewable tablets derived from all-natural fruit essences. Contains no artificial flavours, colours, or preservatives. Antioxidant protection, with whole-food carotenoids to support immunity. Contains no artificial flavors, colors, or preservatives. Chewable All-C with the equivalent of 4 oranges in each tablet. Supports optimal functioning of the immune system. Neo-Plex Concentrate contains the phytonutrient spectrum of whole oranges. Do you have trouble sleeping and do you feel well rested when you wake up every morning? Highly bioavailable calcium, magnesium and vitamin D3. Build strong bones and slow down bone loss. Supports normal blood pressure, optimal nerve and muscle function and PMS. Promotes strong bones and teeth. Are you always getting sick - is your immunity compromised? Exclusive blend of broad spectrum, powerful, immune-boosting carotenoid nutrients from fruits and vegetables. Clinically proven by USDA researchers to boost immune capacity by 37% in just 20 days. Boosts antioxidant levels in the blood to support your vital organs. Exclusive natural formula so unique it was patented. PhytoDefense is the first product of its kind to offer scientifically-proven phytonutrient protection. A convenient way to supplement the diet with a broad-spectrum of naturally occurring carotenoids, flavonoids and the active constituents in cruciferous vegetables. PhytoDefense delivers the equivalent of 6 optimal servings of whole food phytonutrient vegetables. The Drink Pack is a great way to give your body nutrients that promote good health and energy, especially for people who don’t like taking their nutrition in a tablet or softgel form. This pack contains one bottle (32-serving) of Tré nutritional essence. B vitamins for sustained energy and a healthy metabolism. Promotes the active conversion of all food into energy and assists in synthesis and re-energizing of cells and tissues throughout the body. 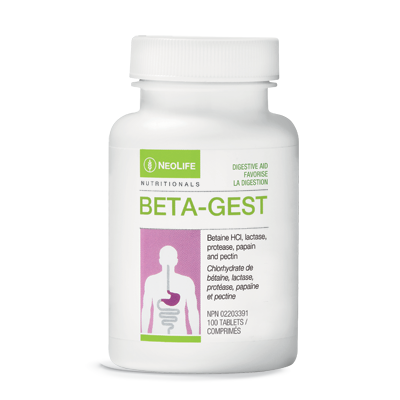 Stomach-targeted enzymes and hydrochloric acid to support efficient digestion. 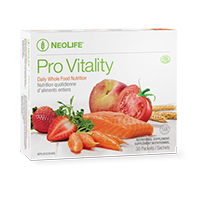 Healthy start to an energy filled day and included Pro Vitality and NeoLife Shakes. 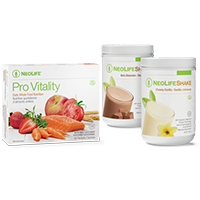 Lose weight the healthy way with Pro Vitality and NeoLife Shakes.